Is This Movie Poster The First Step to Realizing Patton Oswalt's EPIC Star Wars-Avengers-XMen-Clash of the Titans-Fantastic Four Movie? You may have caught Uber nerd Patton Oswalt's Star Wars pitch, filmed during a rehearsal for the latest episode of Parks & Recreation. It was, in a word, EPIC. Especially when you consider that he improvised it. OMG. (Note: it didn't make it into the episode, so you can only watch it online). Possibly the most impressive manifestation of nerdery in recent history. So Oswalt's rant is becoming the stuff of legend in nerd circles. In fact, unlikely source Entertainment Weekly has even gone so far as to design a movie poster in its honour. 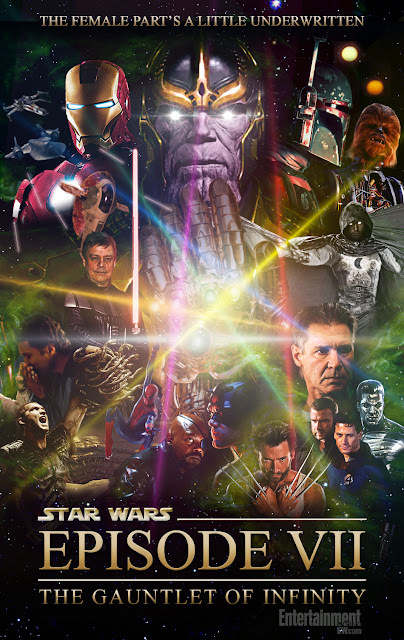 (Further inspired by the poster for Infinity Gauntlet which Oswalt cites in his rant.) EW blogged their poster and ended with the line, "Your move, Abrams." Absolutely perfect. Let's face it. That's not a movie poster. That's the start of a hectalogy. In case you didn't get that, it would be a series with a hundred films. Seriously, there's a lot going on here. Can you even begin to imagine how complex this story line would be? Honestly, all I can imagine is how the Interwebs would be on fire inevitably criticizing the portrayal of all those superheroes in a single film. Pretty sure the web would implode with all the arguing that would ensue. But it would be fun to watch, right? Meantime, let's just all applaud EW's Jef Castro for not only designing the movie poster to end all movie posters, but more importantly for actually understanding the complex storyline of Oswalt’s Episode VII in the first place.